Local (to me) listener Jim Van Heel joins me in Studio MK (Marie’s Kitchen) to read two administrative chapters. Woo hoo! But first, Jim tells us about leaving the church, the difficulties of bringing up the hard topics, and beer. Podcastriarchal blessing – Tyler S.
Intro music by Maps & Transit, Our Happy Life. It was shortened by six seconds to fit the introduction. Grant Palmer was a teacher in the Church Educational System (CES) for 30 years. His book, ‘An Insider’s View of Mormon Origins’ is a great summary of the skimmed over issues most members in the pews are unaware of. His quote, ” Mormon doctrine is 2 miles wide and an inch Early Church deep,” is one of my favorites. His Mormon Stories interview is also highly recommended. There are 35 free episodes on iTunes every one of which has great value – my #1 recommendation is ‘How To Build A Transoceanic Vessel’ episode 2x, throroughly debunking the possibility of Nephi building a boat. However, there are hundreds of great episodes behind a paywall of $9.95 for life, which is incredibly worth it. Publisher of all things Utah, Mormonism, and Americana Signature Books has a great wealth of books on Mormonism like the Parallel Doctrine and Covenants: http://signaturebooks.com/the-parallel-doctrine-and-covenants-the-1832-1833-1833-and-1835-editions-of-joseph-smiths-revelations/ There is also a parallel Book of Mormon. Unfortunately, both are out of print, but awesome display pieces. Follow them on Facebook for up-to-date Mormon news and limited release books. The typical single’s ward is a young single adult ward, meaning from 18 to 30. Once you turn 31 you have to either move on to going to a regular family ward to a much rarer ward for singles 31 and older ward. Uchtdorf didn’t give the talk. It was a nobody member of the 70 named Elder Keaton. According to Wikipedia Poelman spoke again in conference four and a half years later and didn’t become emeritus until 1998 after turning seventy, which has been standard practice for members of the quorum of the seventy for the last several decades. Thanks for having Jim Van Heel on the show; I enjoyed hearing him share his experiences and insights from his Mormon days. I found his account of his father’s encounter with one of the Three Nephites fascinating. 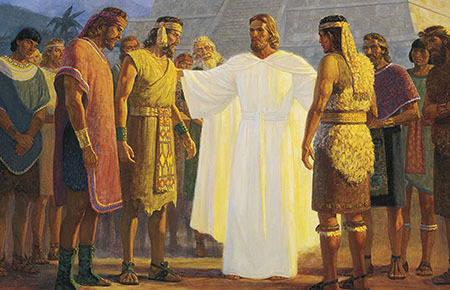 The Three Nephites are one of my favorite entities found in Mormon folklore. Mormons are encouraged to “refrain from discussing stories or other information [about the Three Nephites] that is not found in Church-approved sources.” Good luck with your search at LDS.org. Members are to “avoid speculation” about these guys too, but how can you not? On any given day where are they and what are they doing? Where do they live? Do they have jobs? Or do they just mysteriously show up when they are needed and disappear afterwards? (Beam me up, Scotty.) I once had three people who showed up at my place out-of-the-blue and offered to do some much needed yard work which I couldn’t do. Two of them were female and they all sported tattoos so I knew they couldn’t possibly be the Three Nephites, but their appearance was so serendipitous that I found myself thinking, “Is this what it’s like to be visited by the Three Nephites?” I know that that is pretty silly, but hey, how many TBM’s have thought they have actually been visited by one of these guys? Probably quite a few; they just don’t talk about it!